With the broader market (including Technology) at or right near all-time highs, it is pretty surprising just how weak the semis have been. 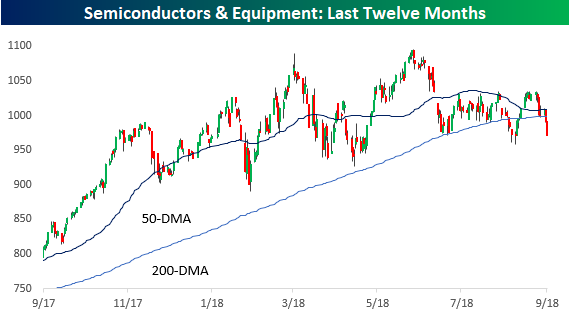 Just yesterday, the S&P 500 Semiconductor and Equipment industry broke back below its 200-DMA, and it is sinking further today following negative comments from Goldman and Stifel. 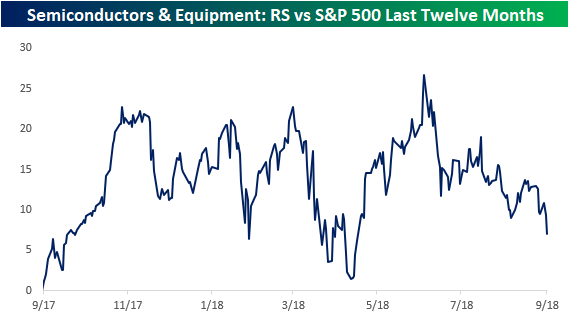 On a relative strength basis versus the S&P 500, the group looks even weaker. Since peaking out in June, the group’s relative strength has been trending sharply lower, and it just made another new short-term low today. 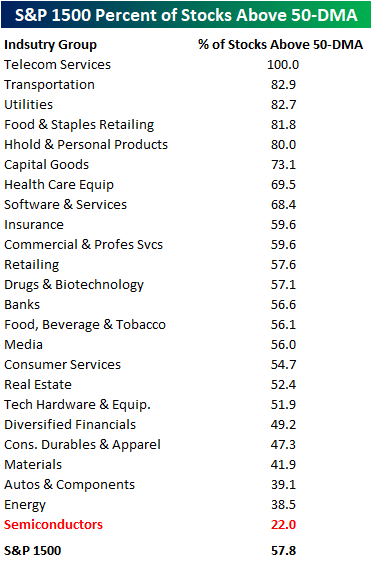 When looking at the various Industry Groups within the S&P 1500 and what percentage of stocks in each one are trading above their 50-DMA, none are currently weaker than the semis. For the S&P 500 as a whole, 57.8% of stocks in the index are above that level. As shown in the table below, with just 22% of stocks in the Semiconductor Industry Group trading above their 50-DMA, no other Industry Group is even close in terms of how few stocks are trading above their 50-DMA. Talk about out of favor!